Nauclea korthalsii Steud. nom. inval. Mitragyna speciosa Korth. (commonly known as kratom, also ketum), is a tropical evergreen tree in the coffee family (Rubiaceae) native to Southeast Asia in the Indochina and Malaysia phytochoria (botanical regions). M. speciosa is indigenous to Thailand, Indonesia, and Malaysia, Myanmar, and Papua New Guinea where it has been used in traditional medicine since at least the nineteenth century. Kratom has some opiate and stimulant like properties. As of 2013 no clinical trials had been done to understand kratom's health effects and it had no approved medical uses. Some people take it for managing chronic pain, for treating opioid withdrawal symptoms, or – more recently – for recreational purposes. Onset of effects typically begin within 5 to 10 minutes and last 2 to 5 hours. Minor side effects may include nausea, vomiting, and constipation. More severe side effects may include seizure, addiction, and psychosis. Other side effects include high heart rate and blood pressure, liver toxicity, and trouble sleeping. When use is stopped withdrawal may occur. Respiratory depression (decreased breathing) is a major risk with all opiates;:196 the medical literature is divided on whether it is a significant side effect of kratom, with some authorities not mentioning it and others emphasizing it. When mixed with other substances, kratom use has resulted in death. In the United States, there were fifteen kratom-related deaths between 2014 and 2016, although in none was kratom the sole factor. As of 2015 there was a growing international concern about a possible threat to public health from kratom use. In some jurisdictions its sale and importation have been restricted, and a number of public health authorities have raised alerts. Sometimes the finished product is mixed into cocktails with other opioids. Mitragyna speciosa is an evergreen tree that can grow to a height of 25 m (82 ft) tall and the trunk may grow to a 0.9 m (3 ft) diameter. The trunk is generally straight and the outer bark is smooth and grey. 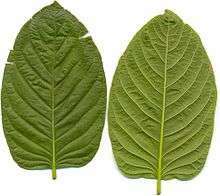 The leaves are dark green and glossy, and can grow to over 14–20 cm (5.5–7.9 in) long and 7–12 cm (2.8–4.7 in) wide when fully open, are ovate-acuminate in shape, and opposite in growth pattern, with 12-17 pairs of veins. The flowers grow in clusters of three at the ends of the branches. The calyx-tube is 2 mm (0.079 in) long and has 5 lobes; the corolla-tube is 2.5–3 millimetres (0.098–0.118 in) long. M. speciosa is indigenous to Thailand, Indonesia, Malaysia, Myanmar, and Papua New Guinea. The United States Drug Enforcement Administration stated in 2013: "There is no legitimate medical use for kratom". Kratom has become popular as a recreational drug and has been promoted with claims that it can improve mood, relieve pain and help with opiate addiction. As of 2013 kratom and key extracts had been studied in cells and in animals but no clinical trials had been conducted. In 1836, kratom was reported to be used as an opium substitute in Malaysia. 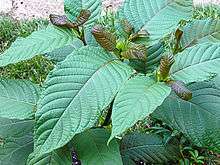 Kratom was also used as an opium substitute in Thailand in the nineteenth century. Data on how often it is used worldwide are lacking as it is not detected by typical drug screening tests. Rates of kratom use appears to be increasing among those who have been self-managing chronic pain with opioids purchased without a prescription and are cycling (but not quitting) their use. As of 2011, there have been no formal trials to study the efficacy or safety of kratom to treat opioid addiction. In cultures where the plant grows, it has been used in traditional medicine. The leaves are chewed to relieve musculoskeletal pain, increase energy, appetite, and sexual desire in ways similar to khat and coca. The leaves or extracts from them are used to heal wounds and as a local anesthetic. Extracts and leaves have been used to treat coughs, diarrhea, and intestinal infections. Kratom is often used by workers in laborious or monotonous professions to stave off exhaustion as well as a mood enhancer and/or painkiller. In Thailand, kratom was "used as a snack to receive guests and was part of the ritual worship of ancestors and gods." The herb is very bitter and is generally combined with a sweetener. Across Southeast Asia and especially in Thailand, in the 2010s a tea-based cocktail known as 4×100 became popular among some younger people. It is a mix of kratom leaves, cough syrup, Coca-Cola, and ice; as of 2011 people who consumed this were often viewed more negatively than users of traditional kratom, but not as negatively as users of heroin. As of 2012, use of the cocktail was a severe problem among youth in three provinces along the border with Malaysia. In the US as of 2015 kratom was available in head shops and over the internet; prevalence of use was unknown as of that time. At relatively low doses (1–5 g of raw leaves) at which there are mostly stimulant effects, side effects include contracted pupils and blushing; adverse effects related to stimulation include anxiety and agitation, and opioid-related effects like itching, nausea, loss of appetite, and increased urination begin to appear. At moderate (5 to 15g of raw leaves) doses and higher, at which opioid effects generally appear, additional adverse affects include tachycardia (increased stimulant effect) as well as the opioid side effects of constipation, dizziness, hypotension, dry mouth, and sweating. Frequent use of high doses of kratom may cause tremor, anorexia, weight loss, seizures, and psychosis. If heavy users try to stop using kratom they may experience withdrawal symptoms including irritability, feelings of distress, nausea, hypertension, insomnia, runny nose, muscle and joint pain, and diarrhea. In July, 2016, the Centers for Disease Control (CDC) issued a report stating that between 2010 and 2015 US Poison Centers received 660 reports of exposure to kratom. Medical outcomes associated with kratom exposure were reported as minor (minimal signs or symptoms, which resolved rapidly with no residual disability) for 162 (24.5%) exposures, moderate (non-life-threatening, with no residual disability, but requiring some form of treatment) for 275 (41.7%) exposures, and major (life-threatening signs or symptoms, with some residual disability) for 49 (7.4%) exposures. One death was reported in a person who was exposed to the medications paroxetine (an antidepressant) and lamotrigine (an anticonvulsant and mood stabilizer) in addition to kratom. For 173 (26.2%) exposure calls, no effects were reported, or poison center staff members were unable to follow up again regarding effects. Overdose of kratom is managed similar to the overdose of opioids, and naloxone can be considered to treat an overdose that results in a reduced effort to breathe despite mixed results for its utility in animal models. Kratom has become a subject of concern in many countries because of the rising number of hospital visits and reports of deaths associated with its users. According to a 2016 review: "Although death has been attributed to kratom use, there is no solid evidence that kratom was the sole contributor to an individual’s death"; there is evidence that it has contributed to deaths. 15 deaths in the United States between 2014 and 2016 were kratom-related. Examples of other substances found in autopsies along with kratom have included: propylhexedrine; acetaminophen, morphine, and promethazine; temazepam, diphenhydramine, and dextromethorphan. (In this last case, levels of mitragynine were higher than those of other drugs, and there was pulmonary edema and other signs of opioid toxicity, and kratom was declared the possible cause of death). In an additional case there were high levels of mitragynine and signs of opioid toxicity on autopsy. There were nine cases of death reported in Sweden in 2010 and 2011 relating to use of Krypton, which was kratom mixed with O-Desmethyltramadol. The key psychoactive compounds in M. speciosa are mitragynine and 7-hydroxymitragynine (7-HMG), but there are more than 40 compounds in M. speciosa leaves, including about 25 alkaloids other than mitragynine and 7-hydroxymitragynine including mitraphylline, mitragynine pseudoindoxyl, and Rhynchophylline. Other active chemicals in M. speciosa include raubasine (best known from Rauvolfia serpentina) and Pausinystalia johimbe alkaloids such as corynantheidine. Mitragynine is about 60% of alkaloid extractions, while 7-hydroxymitragynine is about 2%. The chemical structure of mitragynines incorporates the nucleus of the tryptamine, and these may be responsible for the molecules observed in the serotonin and adrenergic systems. Mitragynine is structurally similar to yohimbine and voacangine. As of 2015, much of the pharmacology of kratom was not well understood. Kratom contains 7-hydroxymitragynine which has been shown to be 13x stronger than morphine as an antinociceptive agent in mice. Kratom appears to have a stimulant effect at lower doses and an opioid-like effect at higher doses; different varieties of kratom may have more powerful stimulant or opioid effects. Both mitragynine and 7-HMG are selective full agonists of the μ-opioid receptor; 7-HMG appears to have higher affinity. The stimulant effects appear be mediated via prevention of activation of serotonin 5-HT2A receptors and postsynaptic α2-adrenergic receptors. Rhynchophylline is a non-competitive NMDA antagonist contained in kratom. Mitragynine is metabolized in humans via phase I and phase II mechanisms with the resulting metabolites excreted in urine. In in vitro experiments, kratom extracts inhibited CYP3A4, CYP2D6, and CYP1A2 enzymes, which results in significant potential for drug interactions. The plant's active compounds and metabolites are not detected by a typical drug screening test, but can be detected by more specialized testing. Blood mitragynine concentrations are expected to be in a range of 10–50 μg/L in persons using the drug recreationally. Detection in body fluids is typically by liquid chromatography-mass spectrometry. Mitragyna speciosa was first formally described by the Dutch colonial botanist Pieter Korthals in 1839 and then in a 1897 publication by George Haviland. The genus was named Mitragyna by Korthals because the stigmas in the first species he examined resembled the shape of a bishop's mitre. It is botanically related to the genera Corynanthe and Uncaria. As of January 2015 neither the plant nor its alkaloids were listed in any of the Schedules of the United Nations Drug Conventions. In Europe as of 2011 the plant was controlled in Denmark, Latvia, Lithuania, Poland, Romania and Sweden. As of 2013, kratom was listed by ASEAN in its annex of products that cannot be included in traditional medicines and health supplements that are traded across ASEAN nations. As of January 2015 kratom was controlled as a narcotic in Australia and under the Medicines Amendment Regulations of New Zealand. Possession of kratom leaves is illegal in Thailand. The Thai government passed the Kratom Act 2486, effective August 3, 1943, which made planting the tree illegal, in response to a rise in its use when opium became very expensive in Thailand and the Thai government was attempting to gain control in the opium market. In 1979, the Thai government placed kratom along with marijuana in Category V of a five category classification of narcotics. Kratom accounted for less than 2% of arrests for narcotics between 1987 and 1992. The government considered legalizing kratom in 2004, 2009, and 2013. The use of kratom leaves, known locally as 'ketum', is prohibited in Malaysia under Section 30 (3) Poisons Act 1952 and the user may be fined with a maximum amount of MYR 10,000 (USD 3,150) or up to 4 years imprisonment. Certain parties have urged the government to penalize the use of kratom under the Dangerous Drugs Act instead of the Poisons Act, which will carry heavier penalties. The FDA started working with other US agencies to seize shipments of imported kratom in 2014, as the product was being marketed as a dietary supplement but had never been shown to be part of the US diet nor to be Generally Recognized as Safe. On 30 August 2016, the Drug Enforcement Administration (DEA) announced its intention to place the active materials in the kratom plant into Schedule I of the Controlled Substances Act as a warning about an imminent hazard to public safety, citing over 600 calls to poison control centers between 2010 and 2015 and 15 kratom-related deaths between 2014 and 2016. This drew strong protests among those using kratom to deal with chronic pain or wean themselves off opioids or alcohol. A group of 51 members of the US House of Representatives and a group of 9 senators each sent letters to Acting DEA Administrator Chuck Rosenberg protesting the listing and around 140,000 people signed an online White House Petition protesting it. The DEA noted the responses but said that it intended to go forward with the listing; a spokesman said: "We can't rely upon public opinion and anecdotal evidence. We have to rely upon science." In October 2016, the DEA withdrew its notice of intent while inviting public comments over a review period ending 1 December 2016. As of May 2016, Alabama, Arkansas, Indiana, Tennessee, Vermont, and Wisconsin had made kratom illegal, and the US Army had forbidden soldiers from using it. ↑ Mitragyna speciosa (Korth.) Havil. is an accepted name . Theplantlist.org. Retrieved 2013-12-26. ↑ Mitragyna speciosa information from NPGS/GRIN. Ars-grin.gov. Retrieved 2013-12-26. 1 2 3 4 5 6 7 8 9 10 11 Rech, MA; Donahey, E; Cappiello Dziedzic, JM; Oh, L; Greenhalgh, E (February 2015). "New drugs of abuse.". Pharmacotherapy. 35 (2): 189–97. doi:10.1002/phar.1522. PMID 25471045. 1 2 3 4 5 6 7 8 9 10 11 12 13 14 15 16 17 18 19 20 21 22 23 24 25 26 27 28 29 Warner ML, Kaufman NC, Grundmann O (2016). "The pharmacology and toxicology of kratom: from traditional herb to drug of abuse". Int. J. Legal Med. (Review). 130 (1): 127–38. doi:10.1007/s00414-015-1279-y. PMID 26511390. 1 2 3 4 5 6 "DEA Announces Intent to Schedule Kratom: SE Asian drug is imminent hazard to public safety". US Drug Enforcement Administration. 30 August 2016. Retrieved 31 August 2016. 1 2 3 4 5 Anwar, Mehruba; Law, Royal; Schier, Josh (2016-01-01). "Notes from the Field: Kratom (Mitragyna speciosa) Exposures Reported to Poison Centers — United States, 2010–2015". MMWR. Morbidity and Mortality Weekly Report. 65 (29): 748–749. doi:10.15585/mmwr.mm6529a4. ISSN 0149-2195. PMID 27466822. 1 2 3 4 5 "KRATOM (Mitragyna speciosa korth)" (PDF). U.S. Drug Enforcement Administration. January 2013. Archived from the original (PDF) on 11 June 2016. 1 2 "Import Alert 54-15". FDA. 25 July 2016. Retrieved 4 October 2016. 1 2 3 4 5 "Kratom profile (chemistry, effects, other names, origin, mode of use, other names, medical use, control status)". Page last updated 8 January 2015: European Monitoring Centre for Drugs and Drug Addiction. Retrieved 12 September 2016. ↑ Karch, Steven B.; Drummer, Olaf (2015). Karch's Pathology of Drug Abuse, Fifth Edition. CRC Press. p. 528. ISBN 9781439861479. 1 2 3 4 5 6 Eisenman, Sasha W (2014). "Chapter 5. The Botany of Mitragyna speciosa (Korth.) Havil. and Related Species". In Raffa, Robert B. Kratom and Other Mitragynines: The Chemistry and Pharmacology of Opioids from a Non-Opium. CRC Press. pp. 57–76. ISBN 978-1-4822-2519-8. 1 2 3 4 5 Adkins, Jessica E.; Edward W. Boyer; Christopher R. McCurdy (2011-05-01). "Mitragyna speciosa, a psychoactive tree from Southeast Asia with opioid activity". Current Topics in Medicinal Chemistry. 11 (9): 1165–1175. doi:10.2174/156802611795371305. PMID 21050173. ↑ Singh, Darshan; Narayanan, Suresh; Vicknasingam, Balasingam (September 2016). "Traditional and non-traditional uses of Mitragynine (Kratom): A survey of the literature". Brain Research Bulletin. 126: 41–46. doi:10.1016/j.brainresbull.2016.05.004. ↑ Tanguay, Pascal (April 2011). "Kratom in Thailand: Decriminalisation and Community Control?" (PDF). Transnational Institiute. Young people feel the need to drink 4x100 in hidden settings due to fears of arrest by law enforcement. In one district, 21 of 39 villages reported the presence of 4x100 users in their community. Compared to traditional use, 4x100 users are subject to some measure of community discrimination, though community perceptions are far milder than for yaba or heroin users. ↑ Fuller, Thomas (23 July 2012). "A Fading Thai Drug Finds Its Resurgence in a Cocktail". The New York Times. ↑ Nelson, Michael E.; Bryant, Sean M.; Aks, Steven E. (2014). "Emerging Drugs of Abuse". In Smith, Silas W.; Lugassy, Daniel M. Clinical Toxicology, An Issue of Emergency Medicine Clinics of North America, Volume 32, Issue 1 of The Clinics: Internal Medicine. Elsevier Health Sciences. pp. 1–28. ISBN 9780323266550. ↑ Prozialeck, WC; Jivan, JK; Andurkar, SV (2012). "Pharmacology of kratom: an emerging botanical agent with stimulant, analgesic, and opioid-like effects". The Journal of the American Osteopathic Association. 112 (12): 792–799. PMID 23212430. ↑ Matsumoto, K; Horie, S; Ishikawa, H; Takayama, H; Aimi, N; Ponglux, D; Watanabe, K (12 March 2004). "Antinociceptive effect of 7-hydroxymitragynine in mice: Discovery of an orally active opioid analgesic from the Thai medicinal herb Mitragyna speciosa.". Life sciences. 74 (17): 2143–55. PMID 14969718. ↑ Baselt RC (2014). Disposition of toxic drugs and chemicals in man. Seal Beach, Calif.: Biomedical Publications. p. 1382. ISBN 978-0-9626523-9-4. ↑ Pieter Willem Korthals, "Observasions de Nauclais Indicis"; Bonnea; 1839; p. 20. ↑ "Annex I: ASEAN Guiding Principles For Inclusion into or Exclusion from the Negative List of Substances for Traditional Medicines and Health Supplements" (PDF). Association of South East Asian Nations (ASEAN). June 28, 2014. Retrieved September 12, 2016. ↑ Cheurprakobkit, Sutham (2000). "The drug situation in Thailand: the role of government and the police". Drug and Alcohol Review. 19 (1): 17–26. doi:10.1080/09595230096101. ↑ Prasert, Poungchompoo (October 4, 2013). "Decision yet to be reached on making 'kratom' legal". The Nation (Thailand). ↑ "Amend the Act leaves the density of the Dangerous Drugs Act". 13 December 2012. Retrieved 18 April 2014. ↑ Pengasih wants abuse of kratom leaves penalised under Dangerous Drugs Act. The Malaysian Insider. October 28, 2012. ↑ "Product Seizure Shows FDA Serious about Kratom". Natural Products Insider. 9 January 2016. ↑ "Import Alert 54-15; Detention without physical examination of dietary supplements and bulk dietary ingredients that are or contain Mitragyna speciosa or kratom". U.S. Food and Drug Administration. 28 February 2014. Retrieved 18 April 2014. ↑ Silverman, Lauren (12 September 2016). "Kratom Advocates Speak Out Against Proposed Government Ban". NPR. Retrieved 12 September 2016. ↑ Ingraham, Christopher (September 30, 2016). "DEA defies senators' appeal to reconsider 'unprecedented' kratom ban". Washington Post. ↑ Stapleton, Christine (September 29, 2016). "Congress members ask DEA not to ban kratom: opiod research needed". Palm Beach Post. ↑ Nelson, Steven (September 30, 2016). "Kratom Will Remain Legal for Days, Possibly Longer". US News & World Report. ↑ "Kratom Gets Reprieve From Drug Enforcement Administration". NPR.org. Retrieved 2016-10-12. ↑ "Withdrawal of Notice of Intent to Temporarily Place Mitragynine and 7-Hydroxymitragynine Into Schedule I: A Proposed Rule by the Drug Enforcement Administration on 10/13/2016". Federal Register. Drug Enforcement Administration. 2016-10-13. Retrieved 2016-10-18. ↑ Brown, Melissa (May 20, 2016). "States ban kratom supplement over abuse worries". Associated Press via US News & World Report. ↑ Schwarz, Alan (2 January 2016). "Kratom, an Addict's Alternative, Is Found to Be Addictive Itself". The New York Times. Wikimedia Commons has media related to Mitragyna speciosa.